Harbor Springs, Michigan has a vibrant, beautiful downtown business district complete with a beach, waterfront, shopping, dining, parks, and even a sailing school. 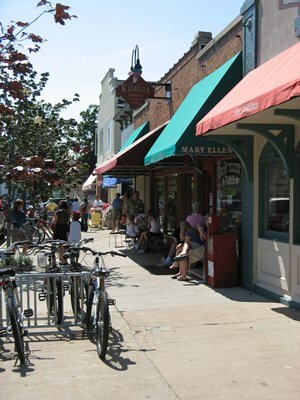 The Harbor Springs business district is two blocks wide by three blocks long and packed with activity and places to explore. You'll find great restaurants from family settings to fine dining, ice cream, candy and fudge, clothing, shoes, books, art galleries, a pharmacy, gift shops, outdoor gear and wear, a bike shop, hair salons, dentists, a kitchen store, banks, a golf shop, coffee shops, eye wear, furniture, home accessories, gourmet foods, a farmers market, and real estate offices. Vibrant? Yes!! You'll also find a beautiful waterfront in Harbor Springs with places to picnic or walk on the dock. The Little Traverse Sailors sail school has been teaching children to sail for nearly 60 years. During the summer months in Harbor Springs, the farmers market is located on Main Street and during the cooler months, the downtown indoor market is a bustling place. The beach on Bay Street includes picnic tables, a changing house, life guards, and swimming platforms. For July 4th, downtown Harbor Springs is the place to be with a parade, art show, street vendors, and fireworks. The waterfront hosts both the Taste of Harbor Springs and Waterfront Wine Festival. Street Musique takes places Thursdays during the summer with fabulous music followed by movies on the Harbor Springs waterfront. Picturesque, vibrant, historic, quaint. No matter how you describe it, Harbor Springs is special.